A friend bought me this for my birthday last summer. He got hold of the list of unread 1001 books that I carry around with me and found one he’d read and ordered it via Ama$on. I’d never heard of it but as he’s done quite a bit of work in politics and therefore is a fan of Wilberforce, he’d read a lot around the battle to end slavery and had come across this title. I was surprised that it’s on the 1001 books list actually as the books are supposed to be novels on there. But the 1001 book does explain that this was the first black writer to be published in Britain and therefore had an influence on British black writing. Having read A Small Island (which I loved), I can see how it would have influenced it. There is a huge difference, I find, between British and American black/ethnic minority writers. The ones from the US always seem to have personal identity crises verging on paranoia if not actually so. The ones in the UK all seem to be focussed on their roots and are more aware, it seems, of the historical events connecting them to the UK. I appreciate the perspective that this brings. And Equiano certainly brings that perspective to bear. It’s a very interesting book for the historical detail alone. I also personally appreciated the story of his Christian conversion too which I found quite moving. He’s picked up by (African) slave traders from his own garden at the tender age of 11 or 12 and shipped off to the West Indies. The rest, you’ll have to read yourself. The edition I read was the Penguin Classics one. The book totals nearly 400 pages but the Interesting Narrative is actually just over 200 pages. What else is included? Well, they seem to have thrown in Equiano’s kitchen sink really. We’ve got everything from lists of subscribers to his book right through to his will and a bunch of letters from his later years. Oh, and let’s not forget 678 endnotes which makes it a bit of a difficult book to physically read as you’re turning to the back of the book an average of 3.5 times a page. Some of these are very helpful, giving historical and other biographical and technical details of life at the time. But I really don’t need to know however that a particular verb was changed in editions 6-9 from the past tense to the present perfect. So, an enjoyable digression for me into 18th century history. Thanks Si! I believe it is difficult for those who publish their own memoirs to escape the imputation of vanity; nor is this the only disadvantage under which they labour: it is also their misfortune, that what is uncommon is rarely, if ever, believed, and what is obvious we are apt to turn from with disgust, and to charge the writer with impertinence. 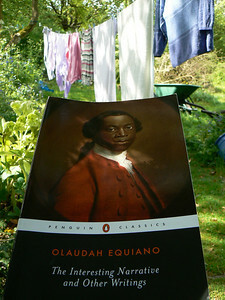 Find out more about Olaudah Equiano. As an author myself I can say that almost all authors write from a personal perspective. this perspective is colored by their culture and upbringing and education of course so you can get a very diverse viewpoint from which a writer will adopt. I dare say Black South Africans would have an even more different perspective from which to write. I am reading a book now with lots of footnotes but instead of at the back they are on the same page as the superscript.